Don't you love it when you stumble on something sweet you'd forgotten about? I made banana chocolate chip mini muffins last night with my over ripe bananas. As I was sitting here this morning eating a couple with my coffee I remembered that not only have these muffins always been a favorite with my kids, but we actually made a "cooking show" over eight years ago. Sure enough, the cooking show is still on my YouTube channel. Wow. What a walk down memory lane. To set the scene - this was 2007. We had just moved into the house we are in now. You might know that we call our youngest daughter "Birdie", but once upon a time our older two kids had nicknames as well. Ashley was "Wumpy" (5 1/2 yrs old here) and Daniel was "Munchkin" (3 1/2 yrs old here). Laurie is of course still "Birdie" and doesn't appear in the video but she was 10 months old at this time. This was probably my one and only time to edit a video and I'm sure my son will laugh at my attempt now that he is semi-professional with video work. Maybe you'll agree with me when I say there is something nice about the non-polished look of our "Cooking Show." Course it could just be nostalgia and cute kids. Here it is! 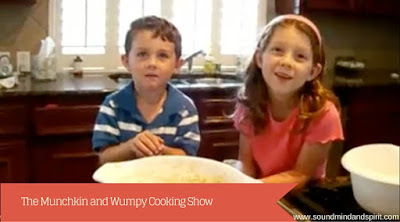 "The Munchkin and Wumpy Cooking Show!" Are you smiling? I know I am. They were so little!!!! Now they are a pre-teen and teen, my size and taller! 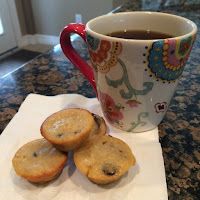 I know the type is too small to read the recipe and you ALL want to make these amazing Banana Chocolate Chip Mini Muffins based on Ashley's recommendation. Just for you, I've put it into a .pdf file you can download and print below. By the way, when you make these, don't expect them to last long. They are bite size and very delicious. Enjoy!